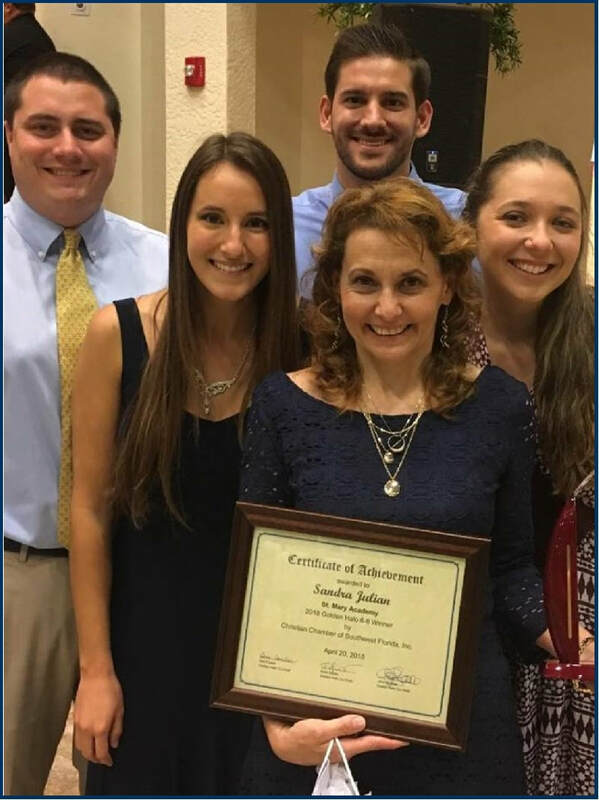 Mrs. Julian wins Teacher of The Year, 12th Annual Golden Halo Awards! April 20, 2018: For the first time in St. Mary Academy history we have a Golden Halo winner! 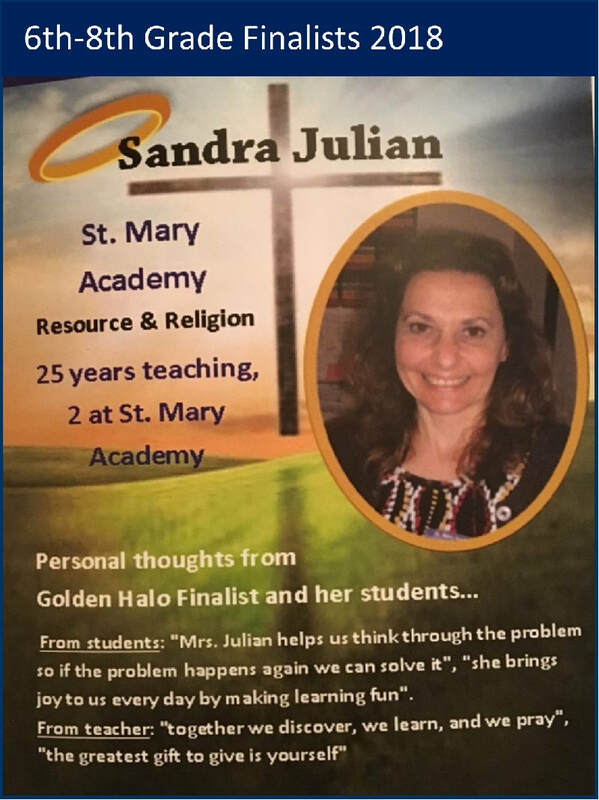 Congratulations to Mrs. Sandy Julian for receiving the honor at the 12th Annual Golden Halo Awards organized by the Christian Chamber of Southwest Florida. Mrs. Julian is our Resource and Religion teacher and won the best teacher award in the category of grades 6th-8th. This is a magnificent honor! We are so proud of her and honored to have her as a teacher at St. Mary Academy! This year’s event took place on April 20th at St. Leo’s Parish Life Center in Bonita Springs. "Mrs. Julian helps us think through the problem so if the problem happens again we can solve it." "She brings joy to us every day by making learning fun." ​"Together we discover, we learn, and we pray." "The greatest gift to give is yourself." Way to go Ms. Julian! She is surrounded by her lovely family who came to support her nomination as Teacher of the Year! Congratulations to Mrs. Sandy Julian, recipient of the Teacher of the Year, Halo Award, 6th-8th grade category. For the past twelve years, the Christian Chamber of Southwest Florida has honored private school teachers with Golden Halo Awards. These awards recognize outstanding teachers in private schools in Lee, Charlotte and Sarasota County. Their objective is that Golden Halo Award recognizes teachers who “educate, motivate, and inspire their students”.